As you move the sound left to right with a mouse, touch-sensitive screen or dataglove the program sends out MIDI information (or any other type of automation information) to the actual mixer (whether it be software or hardware) and pans the sound in real time as you move it. Volume is front to back. If you want it louder, bring the sound image forward. If you want it softer, put it in the background. The grid on the floor is calibrated to the fader. You can tell exactly how loud each sound is by where the shadow is. In addition, whenever you move the sound front or back a tiny window pops up on the shadow showing the exact dB level. The primary goal of the mix window is to show audio masking (where one sound hides another) at each frequency range. The size and height above the shadow of the spheres are functions of the frequency range of the sound over the entire song. 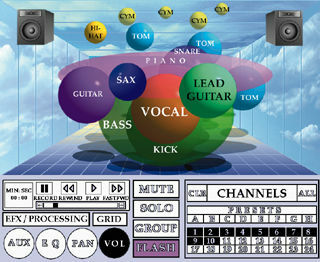 In a full featured program the computer will analyze the frequencies of each sound throughout the song. It will then use an average of the harmonic spectrum, or frequency range, to place the height and size of each sound. On cheaper systems you can choose the height and size that you think the sound should have. If you were to go to the EQ Window and change the EQ it would change the height and size of the sphere in the Mix Window. For example, if you were to brighten up a sound with EQ, the sphere in the Mix Window would be a little higher above the shadow and a little smaller. Each sphere actually represents a channel on the console. Effects Return channels will also be displayed; however, the icon will correspond to the type of effect and panning being used (instead of spheres). If you were using Surround Sound or a 3D Sound Processor, you would see a head in the center of the 3D sound field and you could grab the sound and drag it around in 3D. In this case, Volume would no longer be a function of front to back — it would be based on the size and brightness of the sphere. The current version is such that you put your finger (or mouse) on the top of the sphere to turn it up, and on the bottom of the sphere to turn it down. You may also import any type of images that you desire. Sphere’s are meant to show masking the most realistically. However, you could use “instrument icons,” visuals of the band, or any set of images you like.